Yum! I don’t think I’ve ever made a homemade dressing before. This sounds super yummy and easy to make. I’ll forward you Sarah, it’s a life changer! Once you start making your own you’ll never want to buy dressing agsin. The good news? It’s really quick and easy!! It sounds so good and healthy! I can’t wait to make it! I’ve been looking for new salad dressings! This would be good on so many of our salad recipes. Those flavors are definitely perfect for spring! I am a sucker for everything lemon flavor! I really think I need to make this and enjoy it on my lunch salads! You know I haven’t really made many homemade dressings since I can usually find what I like at the store. But the flavor in this one has me rethinking that. 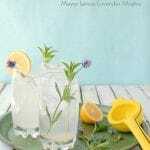 I love all things meyer lemon and this looks like one I need to try! First of all Meyer lemons are exceptional and second of all I would so rather make my own dressing than use the bottle bought store kind! I love knowing exactly what I’m putting on my salad and having it be just as fresh as the ingredients in my salad! I can’t wait to give this a try! 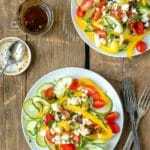 What a wonderful bright and light flavor for the warmer months! 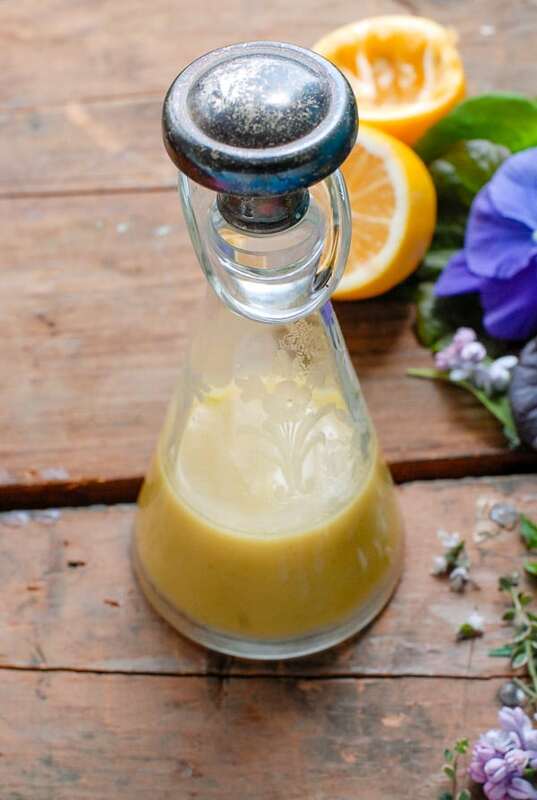 Meyer Lemon Salad dressing sounds like a great option to use. I will have to try this the next time I am making a salad, it simply sounds delicious. I definitely prefer to make my own salad dressing. Your recipe is spot on with what my family likes. Can’t wait to make it. We always make our own salad dressings so we love to get a new recipe to change it up every so often. I never knew there were different lemons so I have to try these. They look similar if they aren’t side by side at the grocery store so be sure you use Meyer lemons! Only 1 tablespoon of meyer lemon? yet it states 1 lemon? They are smaller and often do not yeild as much juice as a regular lemon. That is my experience of aproximately what is needed, 1 Meyer lemon, to yeild 1 tablespoon of juice. Hopefully you will get more juice from yours! I love a good salad! The dressing sounds delish, and I love how simple it is to make! I just pinned this one because I have been looking for a recipe like this. I knew something that’s healthier than I can put in the salad it’s the taste outrageous. This looks like it would fit the bill. I cannot wait to try it. That sounds so good. 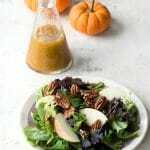 I love lemon in both sweet and savory dishes, and this dressing sounds like the perfect flavor of the warm months to make my salads really pop. Salad dressing is everything. It makes or breaks a salad and this one sounds like a real winner!! 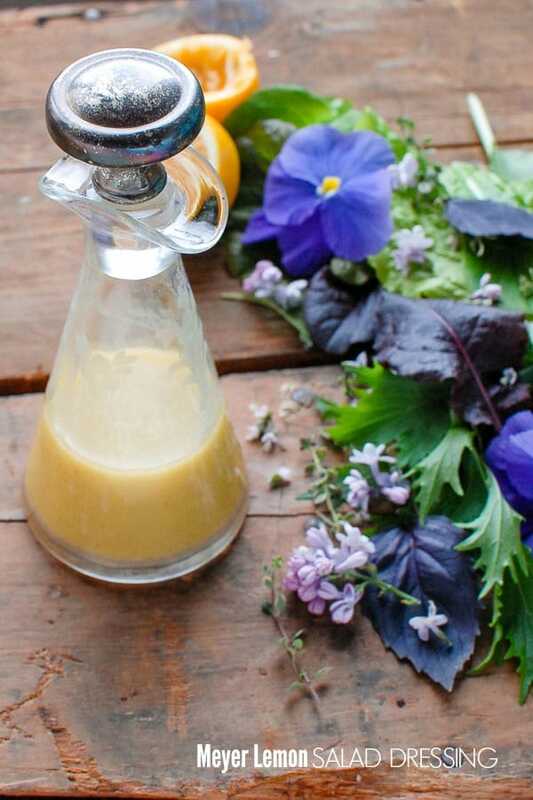 Nom… Meyer lemon dressing sounds delicious! I am always looking for a easy salad dressing to pull together. Thank you! Ugh – I needed this salad during our nasty snowy days. I am so ready for summer! It’s April 2nd and we are getting snow here in Boston today!! Only a few inches, but still…I am SO done! A great dressing to dress up my lettuce greens! Beautiful Salad with my favorite type of dressing. You can’t go wrong w lemon juice and o/o. Does the Meyer lemon give it better flavor than a normal lemon? Now that the snow is melted your flowers and plants will be happy to get some sunshine today! Another fantastic recipe!! 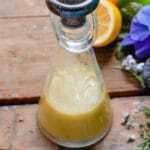 I love citrus dressings and using Meyer lemons is brilliant. Love this!! Whoa. You had snow this week? Oh my. 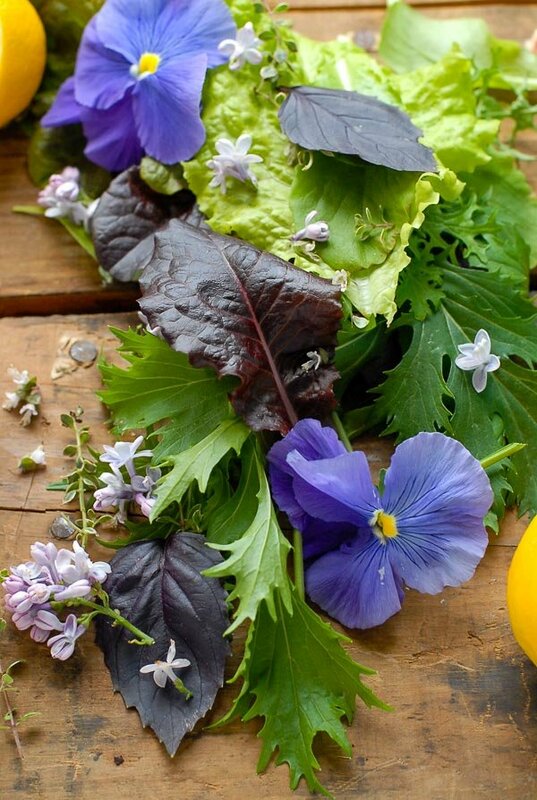 This salad dressing looks very tasty — and I love the idea of rethinking our salad bases. I would love a basil-based salad! The salad I had was only basil and before I tasted it I was very taken aback thinking it would be overpowering. It wasn’t at all! It really opened my mind to getting out of my salad rut. The vegetation in the photo for the dressing is the salad I ate that day; how could one resist something that is such a feast for the eyes?! Toni, your photos are exquisite! As is your salad dressing! My early bird friend! Thank you! We have a pile of snow here so it lifts the spirits a bit too! She does always take such pretty pics! Love the colors!